we go into some detail about this in the class, so here are some notes, slowly turning into a complete article .. 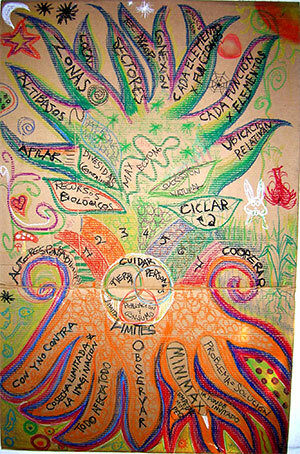 This is the Permaculture Tree, a collective art work we do for each course, and easily summarized the ethics, directive and principles of permaculture in a colourful mind-map. The art-work evolves with each group, and now we have incorporated the 7 Habits and the 'modern tree has a deep tap-root growing from the seed (Ethics) which is the Observe principle - see other tree-map, below. The branches represent the Principles of Design: Stacking, Zones (Local), Sectors, Appropriate Technology, each element serves multiple functions (element analysis), each function fulfilled by multiple elements, relative location. In the trunk we put the Ecological Principles: Biological Resources, Diversity (connections), Natural Patterns, Edge, Natural Succession, Cycling. rather than protracted and thoughtless action." We have made this the "tap root" of our Permaculture Tree because it is such a basic & 'earthing' thing to do.. & which is often forgotten or done too superficially. An enormous amount of mistakes can be avoided by good, thorough, protracted observation. When working with the nature of human beings, it is useful to see them as seedlings: do not throw them poison (criticism, contempt, rush); using renewable resources (love, friendship, encouragement, appreciation), to assist his forces, elements and natural processes, their dreams, desires, tolerances etc., let them mourn, laugh, shake, etc.. (Things that children are natural processes show us humans). A way to re-phrase this is to say: here I have a problem, but maybe this problem is the solution to another problem (so I just need to look for that other problem because here I have it's solution). Then anything can become a positive resource ... just think differently, use lots of imagination, think laterally. This is an important attitude to have in general, as many times what may seem like a problem involves a great opportunity for something, we just have to change our thinking and instead of face the problems, turn it around. And focusing on the problems often just brings our energy down in discouragement, which doesn't help in solving much. Large rocks at the place where we want to build the house can be a problem or we can integrate them into the house as building material. A weed that appears abundantly can be annoying or it can be a resource for compost or feed source for our chickens. The "problems" related to people often have personal difficulties: the irrationalities that often take place at group level and the project can be converted (if not handled soon) in large and complicated dramas. Many projects fail for this reason. If instead, we see these problems as an invitation to release personal difficulties, each 'problem' of this kind becomes a boost to personal growth and learning for all: it is useful to know the technology (mill) to convert the enormous energy emotional (wind) into something useful (electricity). This is an energy & resource saving principle that reminds us to look for the optimal 'leva point' in any situation - eg. making minimal changes in ecosystems to achieve great effects and benefits for all. It is also an invitation to stop & take the time to think and see where it would be most helpful for our efforts to provide long-term effect. Another principle, "Everything gardens" is also a version of this: eg. instead of using your time and energy in turn and then move the compost, why not let the chickens do it, as it's their favorite job? Often, like for most of the other principles, doing something in a MiniMax way requires some lateral thinking & creativity. Dear Papa, Go ahead and plant the tomatoes now. That’s the best I could do under the circumstances. Performance limits or number of uses of resources are only functions of lack of information and of our own imagination. In a garden we can always utilize space more intensively and use vertical space as fences or hedges for other plants to climb on them. On a personal level is usually easy to see the qualities of others and not ours: we have enormous power and we just simply because of our fears, habits, thoughts and imagination. or "It works both ways"
Everything can have advantages & disadvantages, depending on the use we make of it. The disadvantages can be seen as problems and we invest a lot to eliminate the problem or we see it as a positive resource is our task to design just how we can use each resource. In an ecosystem, all elements are interconnected, a change that affects one can have a consequence in others and it can use to our advantage. Some animals or plants can help us in our horticultural tasks. Our thoughts, words and actions have an effect on the world, although we are not aware of it, so important that we try to increase positive and decrease the negative cast out. and create small-scale intensive systems, don't go for 'faraonics', check things work before expanding. as plants and animals to save energy and work (provide fuel, fertilizer, farm the land, control of insects, pests, fire and soil erosion). In modern systems of supply of food is transported, stored and managed by the market. A community is supported by several independent products distribution business and ensures a varied diet without destroying the land that feeds them. Natural systems change over time, leading to a succession of different species of plants and animals. 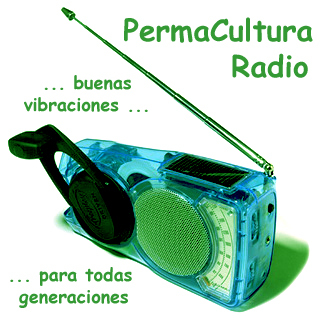 Permaculture the idea is to harness this natural process, such as the weeds are cut or burned, thus slowing the natural succession, creating energy and labor costs. Instead they can use what is already growing (weed helps build soil fertility), or introducing plants that can easily survive and replace the "weeds" with "good herb" that can grow in the same place. The low diversity of a monoculture is unstable, creates jobs and allows the development and spread of pests, while disorder and integrates high diversity, reducing labor and avoiding attack. The performance in a mixed system is much better especially if every element has connections fertile / charities with other elements: the more connections the better. If we consider that in nature the interface between two media has special features (retaining the energy or materials) can be designed to take advantage of them. Each item is located in relation to another so as to assist each other. View areas. Each element of the system can be chosen and positioned so as to fulfill many functions as possible. Basic needs as water, food, energy and fire protection should be covered with two or more ways. Area and sector where they are located plants, animals and structures.